A showery blustery night here at the club, the fire is roaring, nice to be inside warming the bones. We are in a wet period now, fishing is good so it keeps the mind from wandering out there, the warm lodge is like a magnet on nights like this. Big fish of the day was taken at the REEF, guide Buckshot fishing with Van Rex Gallard and Sebastian Periera grabbed 33.5 and 43 lbers respectively. I do not have details yet, but am sure when Buckshot tracks me down I will get the complete story and then some. I saw them playing one of the fish while transiting out to the WEST SIDE hali grounds. Buckshot was frantically waving me over but no, we were on a primitive mission. 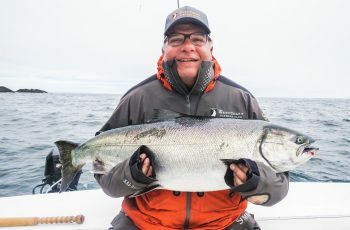 Bud Stafford stumbled on a 37 with Sean Feinstein out at Coho Point this am, a nice tyee from dead waters, Coho Point is alive! Chutters found a couple this pm off Gunia in the mid twenties. 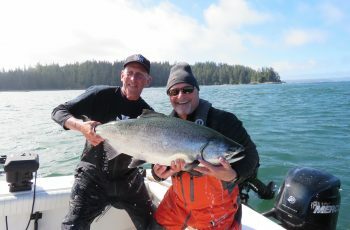 I was fishing with Brad Nelson this am, and we never found any good fishing for chinook til the boats went in at noon. We called a fake bite offshore Pillar, there were a couple in Dunnes box, but most who ran out there, and the whole fleet did, struck out. That was our cue to sneak back to Boulder, where there were no boats, plenty of bait, and Chinooks. Brad played several, taking a 27 as his top fish. The action was steady, but not spectacular. Reaching the dock, I never saw anything in the buckets larger, mostly low twenties and teens. The PM saw me headed west for halibut….relatively calm seas and a ripping tide, oh and a torrential rain, pretty good times. Setting the anchor was an adventure, hacking up the bait and preparing relatively primitive. Covered in slime and stink, dripping in stink, I lowered my concoction to the bottom and not long after a 83 lb halibut had mercy on me and grabbed my hooks. That was easy, but that was it. No more bites at all, dead. Conman was frantic, trying everything in his wheelhouse, but notta. Todd grabbed a 27 and was setting hooks on bottom hang-ups, at least he was busy. The rains hit to make it real fun, we were pounded by the weather, the mutton birds hit the deck, albatross cowering under my tee top. Rained so hard my halibut was fully alive two hours out of the water. 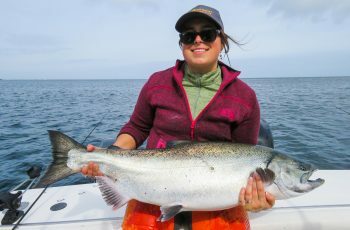 This was the rain of the year, darkest cloud ever, and struck vengeance on us halibut boats. 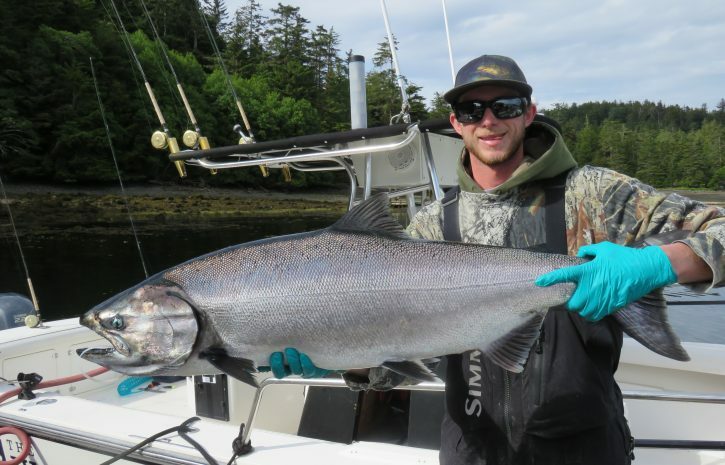 The boats are spreading out, the tyee are now scattered, maybe this rain will heat things up. 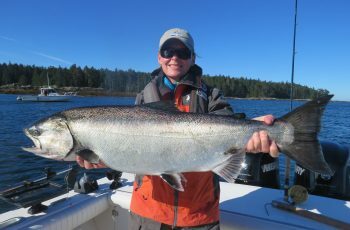 Three tyees on the trip, lots of coho and chinook in the high teens to mid twenties. We are working harder for them now, and the sea lions are back doing what sea lions do up here, creating havoc. There are some young males who have not quite figured out the game, but they are hanging out in Boulder scaring us on every hook up. They are bold, quick, and at the top of their game…and not crowd favourites this year. Well, I am cold and in need of a warm bed so off I go. If we have a fish to tell you about tomorrow, a full report will be posted in the evening, thanks for checking in regularly, and thanks to all guests who have visited us this season. The guides here relish teaching all of you a couple angling tricks, and really enjoy getting all visitors into some fish, while showing you the area, and of course sharing some laughs. 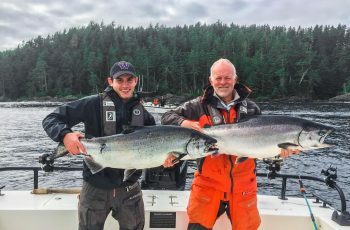 This fishery is one of a kind in British Columbia, a long season of top chinook fishing, I hope everyone gets a chance to visit Langara, and the Clubhouse.